This site has hosted two residences since John Fogarty, an engineer and partner in one of the largest construction contractors Mandan's earliest days, bought the property from the Northern Pacific Railroad in 1882. The first home was constructed by William & Mary Sullivan in 1883. Mr. Sullivan coordinated bridge construction for the railroad. In 1889, the home was sold to Lyman & Anna Cary. Mr. Cary came to Mandan in 1881 and was the land agent for the Northern Pacific Railroad. His territory extended from the Missouri River to the Montana line, and reportedly still holds the record for the most land sale transactions in the state of North Dakota. Mr. Cary also developed major portions of the downtown business district. His wife Anna was the daughter of Mr. James Clark who was an early Mandan pharmacist and the founder of the Mandan Drug Store. At his wife’s request, Mr. Cary had the first house moved to the 300 block of north 3rd Avenue, across from the First Presbyterian Church to enable Anna to participate more in her church activities. The current house constructed in 1904 by Stuart Dunlap. Dunlap was a conductor in the for the Northern Pacific Railway. 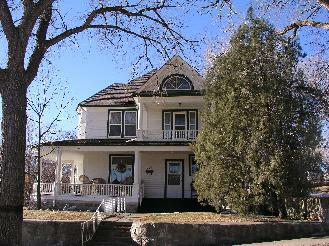 This home was added in 1992 to the National Register of Historic Places as The Stuart Dunlap Home. Its original street address was 201 Mitchell Avenue. Stuart & Martha Dunlap, there six children and housekeepers resided here for over ten years. The maid's quarters were located on the second floor of the home and was equipped with its own staircase access to the kitchen and pantry. Dunlap, the son of Massachusettus furniture makers who had subsequently relocated to Wisconsin had originally installed a rectangular wrap-around porch on the south and east sides of the house, but modified it to the current sweeping rounded corner shortly after he saw a similar design at the 1904 World's Fair. Cora Walton Russell, wife to Mandan Creamery and Produce Company (now Cloverdale Meats) founder Hoy Russell, lived here from 1923 to 1971. 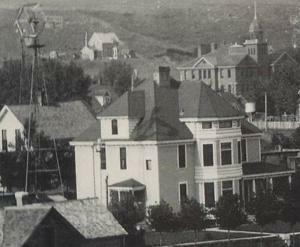 The historical picture depicts the home during her tenure, including the wind vane which powered the pump to fill the upstairs water supply tank. The 1903 Mandan Public School is seen in the background. The home is currently owned by Mandan native Mary Broderick-Harris who refers to it as "Tara." It is a fine example of Queen Anne architectural style and furnished completely for the period. The adjacent two-story shingle-style wood carriage house is also largely the original structure including the second level hay loft.